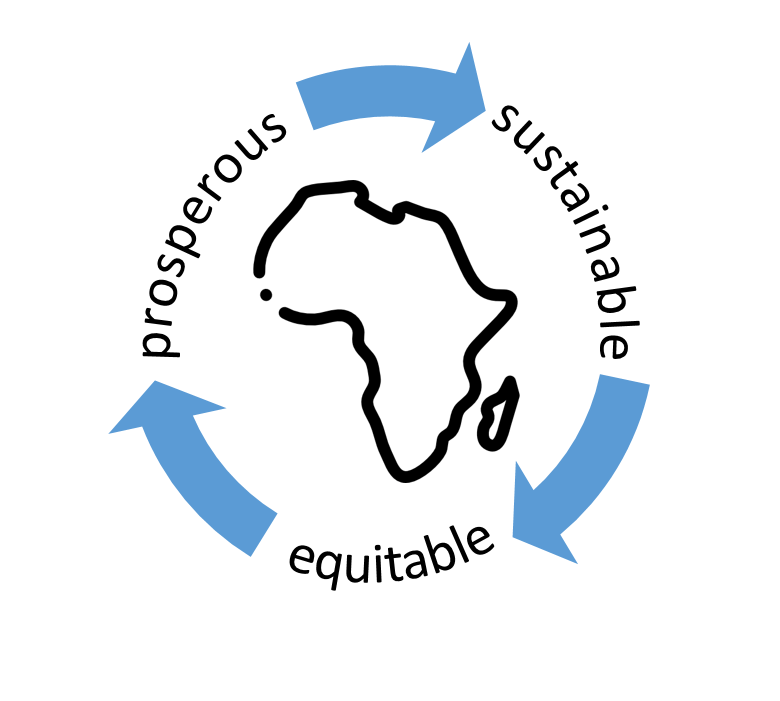 The circular economy in Africa – an opportunity to leapfrog? What lessons can we learn from the evolution of industrialised economies to create more sustainable, equitable and prosperous societies around the world? We are becoming more aware that a culture of ever-increasing consumption and ‘take, make, dispose’ creates pressure on resources, land, and water leads to ever-more pollution and waste, impacting on the health of humans and the living systems we depend on. 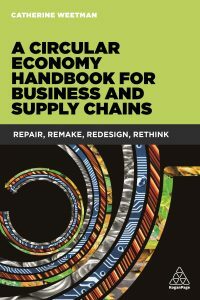 Could the circular economy be the critical link in avoiding ecosystem degradation, expensive or scarce resources, and unethical, unsafe employment practices? Leapfrogging to phone technology across Africa helps avoid the high infrastructure cost of land-based communications, and enables innovative systems like M-PESA mobile banking in Kenya. “Frugal innovation”, fast-developing technologies, systems thinking and the circular economy open up a short cut to sustainable, equitable and prosperous development. My interest in sustainability began in the 1980s, whilst working in Johannesburg for four years as an accountant for Price Waterhouse. Apartheid was still in place and many people lived in severe poverty. I volunteered for a charity that distributed food and clothes into the townships outside the city. I was struck by the dignity and resourcefulness of people I met: making the most of the available materials and encouraging a culture of reuse and repair. Since then, I have travelled to many Sub-Saharan countries, finding similar examples of resilience. Fast-forward to 1990 and back in the UK, listening to management guru Charles Handy’s talk at the RSA. Questioning “What is a Company For?”, he said “The principal purpose of a company is not to make a profit – full stop. It is to make a profit in order to continue to do things or make things and to do so even better and more abundantly”. This radical thinking encouraged me to join Tomorrow’s Company, an independent, non-profit think tank that inspires and enables businesses to be a force for good, which was set up following Charles Handy’s talk and an RSA Inquiry. And so I entered the world of sustainability. But something kept nagging at me. Was this a place of business sustainability (longevity of a firm) or environmental sustainability (caring for the planet), or social sustainability (caring for people and communities)? Or was it all of those? Recent studies are beginning to answer these questions. Working as a consultant in a number of international development agencies, including Tearfund, highlighted how much there was to learn. I decided to go back to school part-time, enrolling at Sussex University in 2013 for the MA in Globalisation Business and Development. After graduating, I returned to South Africa to meet up with four of my interviewees. We wanted to explore how we could contribute towards the key issues facing Africa: widespread poverty, food insecurity, climate change, environmental degradation and the impact of increasing urbanisation. In 2016, we established the African Circular Economy Network (ACEN), a non-profit organisation aiming to “build a restorative African economy that generates well-being and prosperity inclusive of all its’ people through new forms of economic production and consumption which maintain and regenerate its environmental resources”. ACEN now has representatives in 19 countries, facilitating new initiatives through their own national networks. We have a growing number of supporters and welcome anyone interested or involved in the circular economy across Africa. Enquiries are coming in from around the world, particularly from organisations looking for case studies of circular practice in Africa. We are gathering examples to share, including the selection summarised below. We’ve categorised them using the 7 Key Elements framework, with kind permission from our friends at Circle Economy, a renowned social enterprise consultancy based in Amsterdam. Rethink the business model: develop business models that create greater value and use incentives to provide services and access to products and resources. Design for the future: use systems thinking to select materials, design for an appropriate lifetime and extended future use. Collaborate to create joint value: collaborate internally and externally, along the supply chain to increase transparency and create joint value. 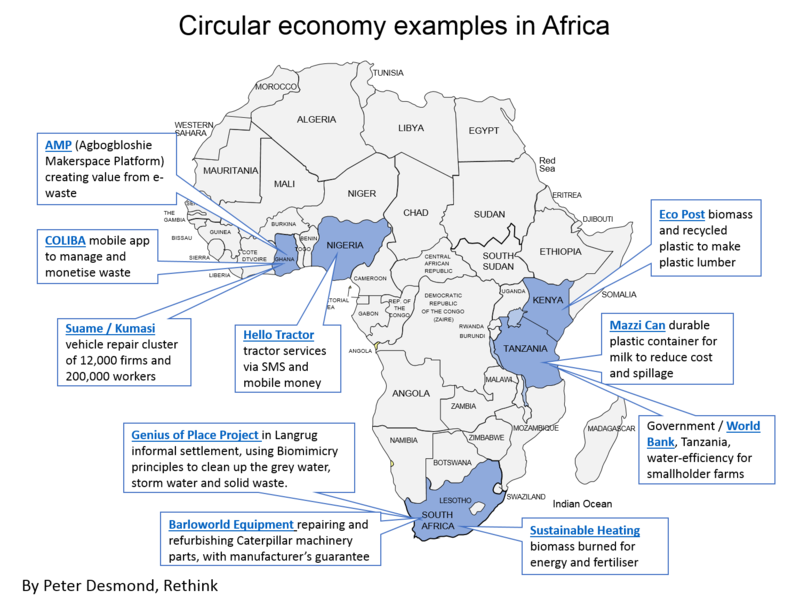 Click to download this Africa circular economy map or Africa Case Study Table – both include links to the examples. These initiatives are just a few of the good circular economy examples in Africa. How could these successfully scale across the continent? Governments can use policies, incentives and legislation at local and national levels, support entrepreneurs, social enterprises and innovation, and help share best practice and lessons learned. The circular economy in Africa can open up a better development path, building on those defining characteristics of resilience and resourcefulness, so enabling Africa to leapfrog to a sustainable, equitable, prosperous and circular economy.